Typical journalist. Instead of making a beeline for the pot o’ gold, he stops to take pictures of the rainbow. 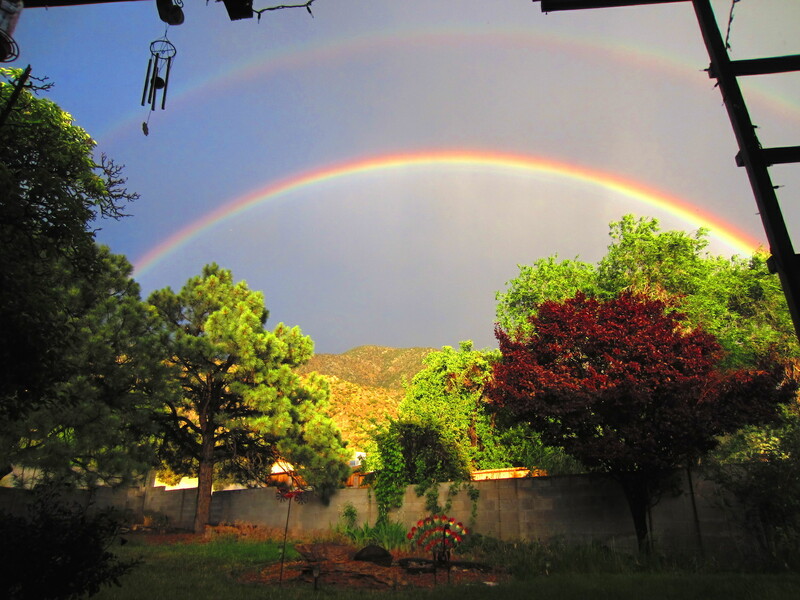 This entry was posted on June 1, 2016 at 8:35 pm and is filed under Albuquerque, Rain. You can follow any responses to this entry through the RSS 2.0 feed. You can leave a response, or trackback from your own site. PS: Love the light and composition of that shot. Nicely done! Had a couple of weird ones over the weekend, out at the in-laws in western Nebraska. First one was low and wide, not too tall, and the sky was black outside the rainbow but lit up inside. Next day, same spot, but tall and skinny. The the third day, no rainbow … just a trio of twisters 15-20 miles south of us. Land spouts, two of which touched down. 15 miles away is about as close as I care to ever come. that is a nice looking back yard. i guess it’s yours? Speaking of weather, someone done turned on the summer switch down here. Temp hit 98 today, higher tomorrow and Saturday. I saw a fire hydrant chasing a dog this afternoon.